Tired of foundations and concealers that seem to slide right off your face halfway through the day or that go on patchy and uneven? We’re not going to let that happen anymore. Here’s a game plan for making your foundation and concealer last and last! How you prep and take care of your skin is the first line of security in helping your foundation and concealer look flawless throughout the day. Here’s what you can do from a skincare perspective to enhance and maintain the results. Start the day by using a gentle cleanser to remove excess oil and debris that can interfere with the performance of foundation and concealer, BUT make sure the cleanser doesn’t dry your skin, which can create uneven texture. Think of it as making a clean, soft, smooth slate for your skin. Refine skin’s texture with an AHA or BHA exfoliant. By gently, and naturally (meaning no scrubs or harsh cleansing brushes), getting rid of built-up dead skin and flakiness, your makeup products will go on more evenly for a seamless appearance. Tip: You don’t have to use an AHA or BHA exfoliant in the morning; adding it to your nightly routine will prep skin beautifully for the following morning. Apply a light layer of eye cream to soften the appearance of fine lines and keep the eye area hydrated, smooth, and brightened. Use a primer with SPF to smooth, hydrate, and protect your skin all-in-one. A primer that combines these benefits (rather than using three separate products) reduces the likelihood of your makeup slipping throughout the day and settling into fine lines. It also creates a surface that is easier for foundation and concealer to glide across and adhere to. It’s a bonus if it also contains anti-aging ingredients. Hint: Our RESIST Smoothing Primer Serum SPF 30 does! How you apply your foundation and concealer absolutely affects how long it will last. Use the techniques we describe below to ensure your foundation and concealer perform at their absolute best. Start with a thin layer of foundation, then build more coverage if needed. A thick layer of makeup is more prone to sliding off your face throughout the day because it just can’t adhere as well to skin. If you have oily skin, try an absorbent shine-control product before you apply your sunscreen and foundation. This can go a long way toward keeping excess shine in check, so your makeup lasts (and looks better) longer. Also consider a matte-finish foundation for longer-lasting wear. When it comes to concealer, start out with a light amount, and build to get the coverage you want. 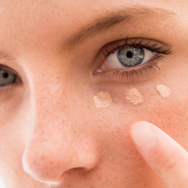 Pat the concealer in place with your fingers, brush, or wand. Do not use a back-and-forth or rubbing motion, as that basically just wipes the concealer away as soon as you apply it, leaving you with spotty coverage. Whether you apply the concealer first before your foundation or after is a personal preference—experiment to see what works best for you. Last, and most important: Set with powder. No matter what type of concealer you use, your makeup will last longer with powder over it. Not a thick layer of powder (which can emphasize fine lines and dry spots on the face), just a soft dusting brushed on areas where you’ve applied foundation and concealer. You can brush on a bit more over oil-prone areas. Avoid touching your face throughout the day or holding your phone propped against your face. We unknowingly touch our faces hundreds of times during the day, and that contact continually wears down our makeup. Try your best to limit that contact and avoid things that could disturb your makeup. Carry blotting papers with you to dab off the excess oil that would normally cause makeup to slip and dissipate. A midday touchup of powder where needed can help. Also, if your blush has faded, touch that up as well. Most makeup setting sprays are similar to hairspray in that they contain water and/or alcohol combined with ingredients that create a "seal" on skin’s surface. They may help makeup last a little longer, but their ingredients tend to be problematic for skin over the long haul. Some setting sprays actually make matters worse, breaking down your makeup instead of helping it. For setting sprays that contain beneficial ingredients, keep in mind that those ingredients won’t be all that effective at nourishing skin because they won’t likely be able to get through your layer of makeup. Last, but certainly not least, pairing the right consistency of foundation and concealer with your skin type and coverage needs is paramount to getting beautiful, long-wearing results. Use our guide to find your perfect match. These hints and guidelines will make all the difference in getting longer-lasting results!